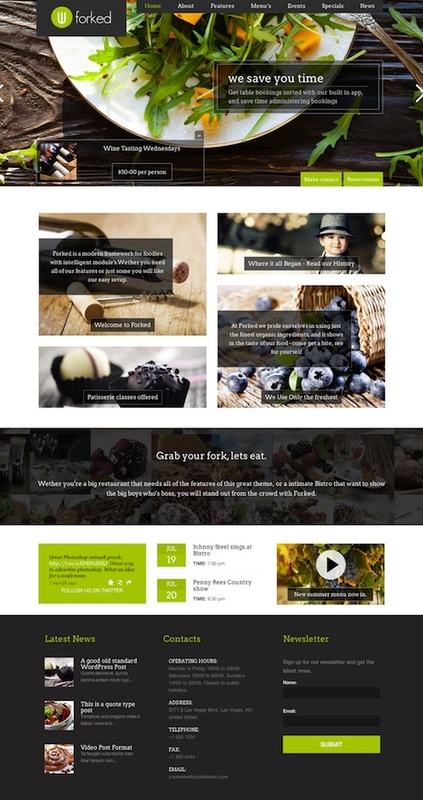 Forked is a WordPress Theme suitable for Restaurants, Bistro’s, Clubs, Cafes, Foodtrucks, Breweries, and anyone in the foodie or event industry. The theme is built on the very unique Restaurants and events framework that brings features to the table that is nowhere to be found outside of this framework. Features include table Table Reservation / Booking System, Specials Management (set and forget specials), Deep Google maps integration (even driving directions), Events and Calendars, Full set of help video’s to get you started, Responsive design, unlimited colors, food menu cards, business hours, newsletter signup, photo gallery, full width image slider, social media integrated, social media icons, countdown timer, localization support and more.